﻿ Granville Inn - Ohio. Find It Here. Located just 30 minutes east of Columbus, Ohio, the Granville Inn is surrounded by rolling hills, soaring trees, and a charming New England style village. Built in 1924, this beloved community treasure boasts luxurious guest rooms, state-of-the-art meeting spaces, a grand ballroom, and a variety of dining options.Our award-winning Oak Room is known for its chef-inspired menus, creative entrées, and a sophisticated ambiance perfect for your most special occasion. 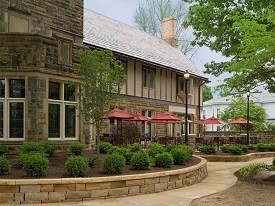 Our Tavern at the Inn is a warm and welcoming spot to enjoy dinner or drinks any night of the week.Whether you choose to explore the areas natural beauty or stay to enjoy all the comforts of our storied property, the Granville Inn is the perfect place to escape, connect, and relax.